This wine has a beautiful pale lemon green colour. The nose consists of Cape gooseberries, lime and green apples. 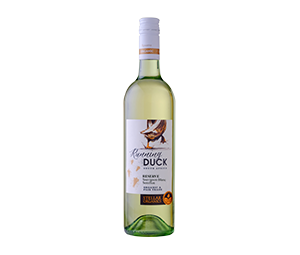 On the palate a flinty undertone builds complexity, accompanied by fresh apples, lime and hints of pineapple, complementing the crisp fresh finish. Categories: Malta, Namibia, Poland, Running Duck Reserve, South Africa. Mild chicken curries such as Chicken Korma or butter chicken; roast chicken with lemon and garlic; pan-fried pork chops; mussels in garlic cream sauce; crayfish tails with seafood mayonnaise; gnocchi with pesto cream sauce.